Established in the year 2008, we, “Doorva Plastic”, is an ISO 9001:2008 certified organization engaged in manufacturing, supplying, exporting, trading & wholesaling a wide range of Plastic Spiral Pipes, Polypropylene & Nylon Pipes and Tubes. We export in Australia, United States, Europe, Middle East & Africa. We export in Making uses of high-grade raw material, our experts manufacture these products using ultramodern machines and cutting-edge production technologies. We offer our products in different sizes and specifications, with the aim to meet the varied needs of the clients. In addition to this, our professionals ensure that all the products meet the international quality standards and are flawless in nature. Further, we also provide customization for the offered products as per the detailed specifications of our clients for their maximum satisfaction. Clients associated with various different sectors such as agricultural, irrigation, engineering, and pharmaceuticals appreciate this range for its excellent finish, light weight, longer life and resistance to substrates such as water, oil, chemicals, alkalies, petroleum & acids and compact design. We have a established a sound infrastructure facility and appointed a dexterous team of professionals, which supports us to achieve all the business goals with ease and perfection. To ensure the production of flawless products, we have established a sophisticated infrastructure facility which is installed latest machines and cutting-edge technologies. Furthermore, to retain superior quality of our offered products, our team make use of optimum-grade raw material sourced from the famed vendors of the industry. Thus, with the support of dedicated team of professionals, sound manufacturing unit and certified vendors of this industry, have gained ISO 9001:2008 under International Organization for Standardization. Owing to the quality products, sound facilities, ethical business policies and fair trade practices we have been able to muster a huge clientèle for ourselves. Under the able guidance of our mentors, 'Mr. Deepak Sahni', we have been able to become the preferred choice of the clients. Their in-depth knowledge, brilliant managerial skills, excellent leadership qualities and business acumen have helped us spread our wings across the world. 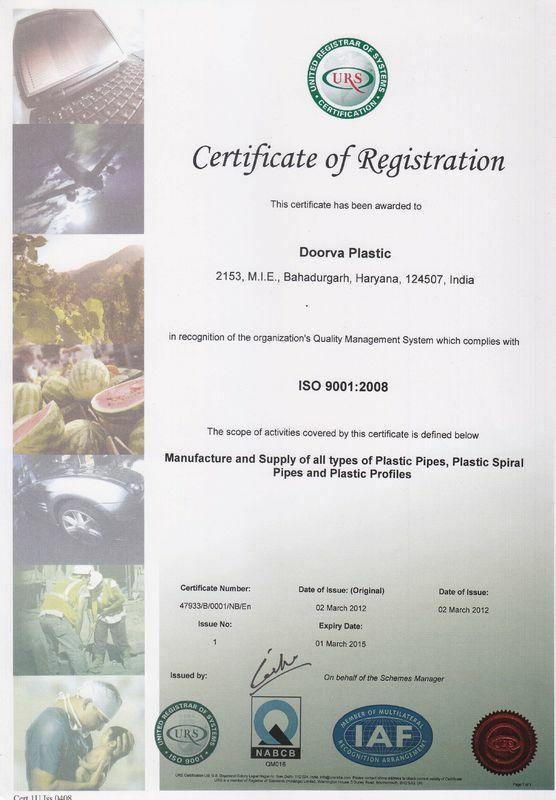 Doorva Plastic is an ISO 9001:2008 certified organization engaged in offering a wide range of Plastic Spiral Pipes, Polypropylene & Nylon Pipes and Tubes. Our offerings are manufactured from high quality LLDPE, HDPE and LDPE plastic pipes, in accordance with the international quality parameters and FDA standards. These quality products are praised for its numerous features and are used in numerous industries including, engineering, agriculture, irrigation and various other manufacturing units. Our products are available in different variations and specifications in terms of size, length, design, colors and other requirements of the clients. We have established a sophisticated infrastructure facility for our firm, spread over a wide area located in Bahadurgarh, Haryana. Our manufacturing facility is spread in 257 Sq. Yards. This facility in segmented into various individual departments that include a manufacturing, quality testing, in-house design, research & development and warehousing unit managed by a dexterous team of professionals. Our facility is outfitted with advanced machines and cutting-edge technologies, which supports us to meet the variegated demands of our clients. Further, our capacious and categorically segregated warehouse serves the purposes of safe and organized storing. Our organization is an ISO certified firm engaged in offering a Plastic Spiral Pipes, Polypropylene & Nylon Pipes and Tubes. All the products offered by us are developed in accordance with the international quality parameters, under the supervision of our experienced team of professionals. With the enormous support of our experienced, skilled and sincere team of professionals, we are engaged in rendering business improving services which includes quick quotes, expert technical advice and custom color matching for our offered range of products to our clients. As our products are catering to various industrial applications, our organization provide custom services for both retail or bulk purchasing. Our professionals have good relationship with our clients, so as to serve them as par their exact requirements. Moreover, our clients suggestions and feedbacks aids us to offer services as par their specifications and thus we have succeeded in solving queries of our clients. Our organization is engaged in meeting varied needs of the clients in a best possible manner and is aimed towards to adding more maximum satisfied clients with us. We strive to offer high standards products in accordance with the ISO standards, so that the clients find us as a reliable sourced for their products. Moreover, valuing the importance of time of clients, our professionals ensure that all the consignments are delivered with the in the promised time-frame at our clients doorstep. Our organization is has recruited a team of diligent professionals, to execute all our business related activities in an organized manner. All the professionals associated with us are highly qualified make optimum use their in-depth knowledge and expertise to accomplish all their assigned tasks with perfection. Our professionals work in close coordination with each other as well as with our clients to serve them as par their requirements. Moreover, to ensure the flawlessness of our products, we have appointed a team of dexterous quality controllers. Besides this, we organize various workshops and training sessions to keep our team abreast with the changing market challenges and technologies.